On February 7th, also known as Super Bowl Sunday, CatholicTV will air “Faith Bowl III”. Faith Bowl is a round-table discussion by sports celebrities about the challenges of living the Catholic faith amidst the glitz and glamour of professional sports. 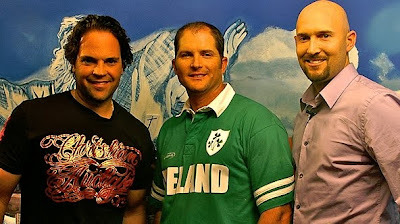 The 2010 Faith Bowl features professional athletes Mike Piazza, Mike Sweeney, and the Minnesota Twins’ Bobby Keppel. *Mike Piazza, a retired catcher after a 16-year career in Major League Baseball, mostly with the New York Mets and Los Angeles Dodgers. He was a 12-time All-Star and the 1993 National League "Rookie of the Year." *Mike Sweeney, a designated hitter for the Seattle Mariners in 2009, a 15-year MLB veteran and five-time selection to the All-Star team as a Kansas City Royal. *Bobby Keppel, a relief pitcher for the Minnesota Twins. He appeared in 37 games in 2009 and was the winning pitcher of the Twins' playoff game with the Detroit Tigers for the American League Central Division title. He is the Faith Bowl III moderator.